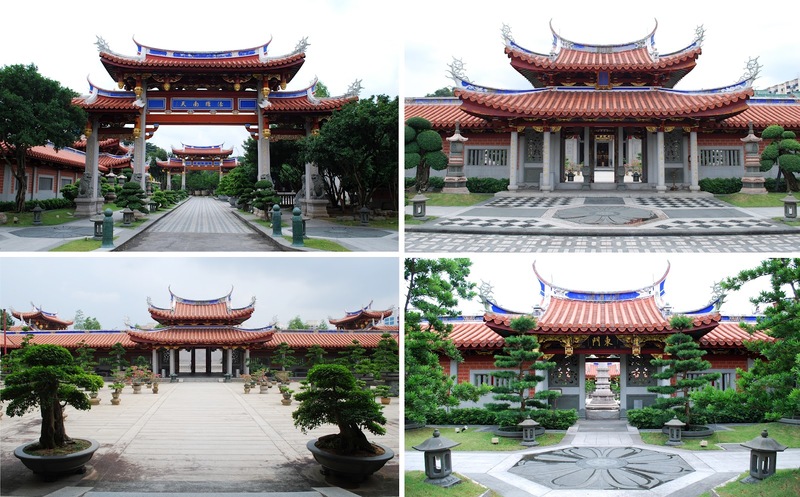 The Mahavira Hall at the Lian Shan Shuang Lin monastery, with large penjing flanking the entryway and steps to the temple. Pretty much since we came to Singapore, I've been intrigued by a sprawling temple area that sits just a stone throw from a hectic highway, amongst a sea of tall apartment buildings. 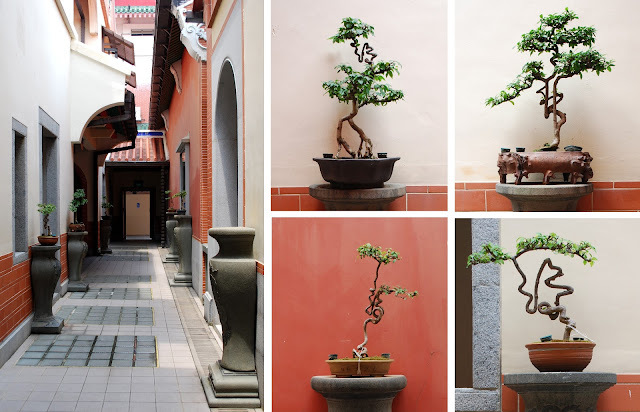 It is the home of Lian Shan Shuang Lin Monastery, Singapore's oldest Buddhist monastery . 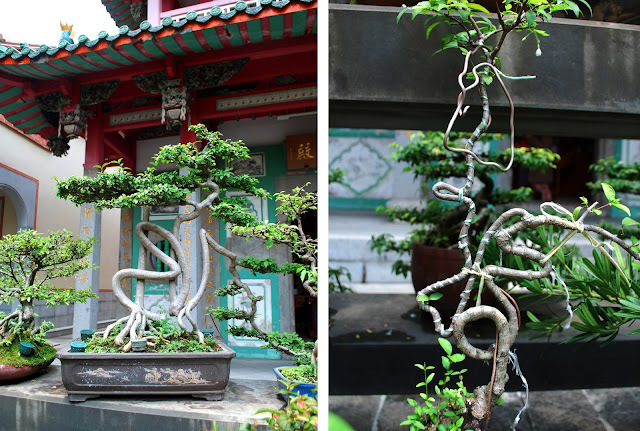 Large, carefully trained penjing (Chinese meaning "tray scenery", a close relative to the Japanese bonsai) in huge planters carved out of single pieces of granite are displayed all over the monastery. They require enormous amounts of maintenance - a sign of reverence. Elaborate gates lead to the different temples and inner gardens (my favorites) of the monastery. 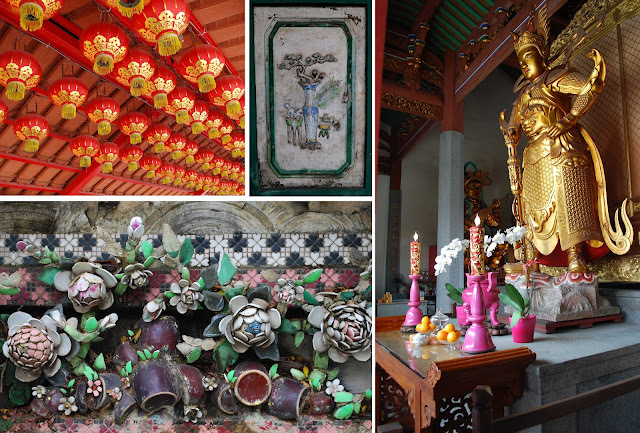 The history of Lian Shan Shuang Lin Monastery - locals seem to call it only the Shuang Lin temple - reflects Singapore itself. 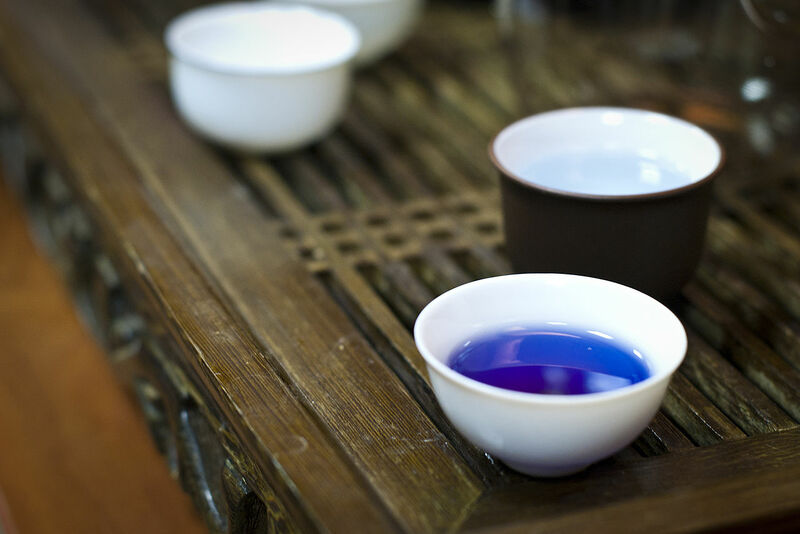 It was founded by a Low Kim Pong, a devoted Buddhist, who in the 1850s left his family and poor circumstances in mainland China for Singapore and became a highly successful entrepreneur here. The story goes that Low Kim Pong literally dreamt this monastery into being; according to the notes, one night in 1898 he "dreamt of a sacred man, radiating golden light, approaching from the West to the water front. Believing this to be an omen and with a continuing enthusiasm, they went to the waterfront and waited patiently." 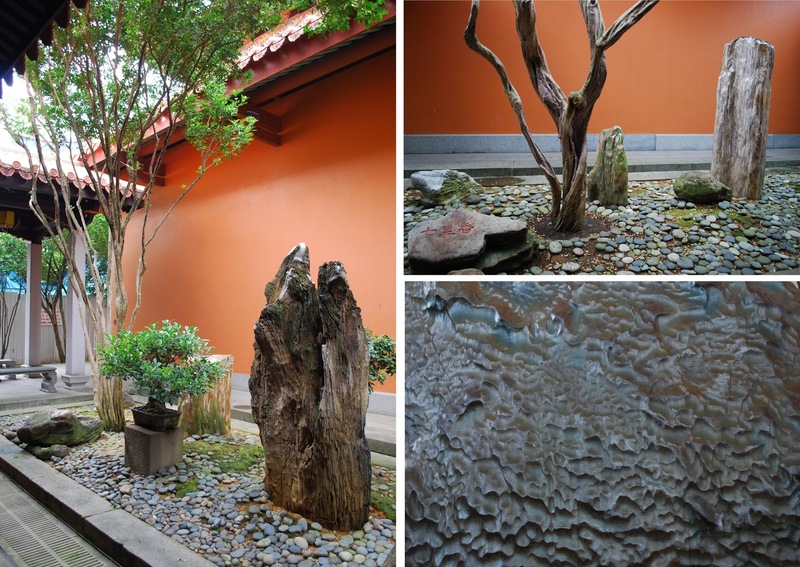 Water - an integral element in Chinese gardens - is present in pots, fountains and even a large half-moon pond. 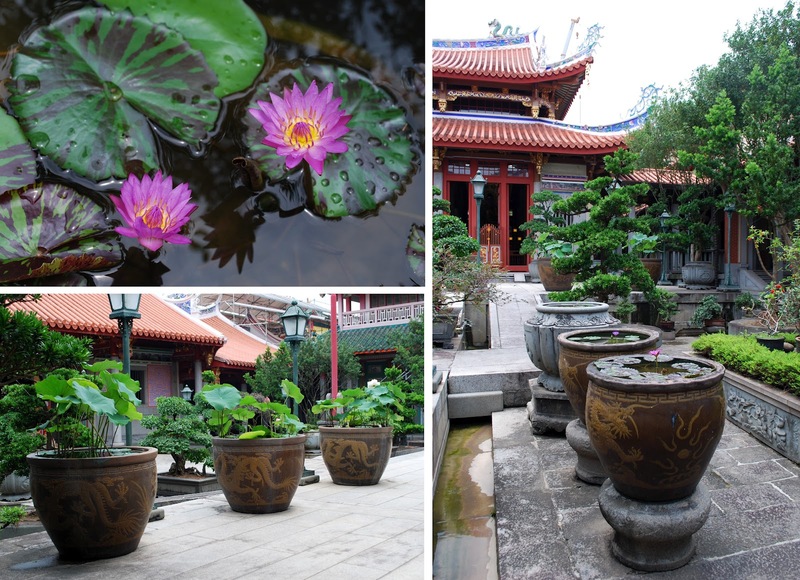 I love the huge dragon jars and the little waterlilies with their leaves streaked with dark burgundy. 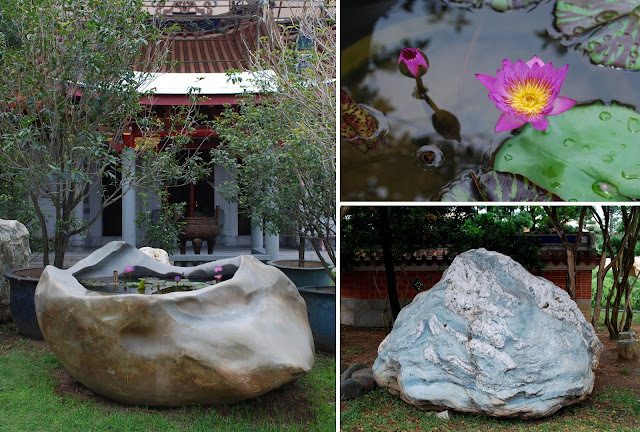 More water and waterlilies, this time in a huge boulder carved into a birdbath. And another huge, expressive boulder typical to Chinese gardens; unfortunately the sign was in Chinese that I do not understand (yet?). Luckily for Low Kim Pong, a boat finally arrived at dusk carrying Venerable Xian Hui and his family of 12 Buddhist monks and nuns. After six years of pilgrimage to India, Ceylon and Burma, they were stopping over in Singapore on their way home to China. Xian Hui agreed on Low Kim Pong's vision about founding a Buddhist monastery in Singapore, and he became the first abbot in the new institution built on 50 acres of land donated by Low Kim Pong in what today forms the busy suburb of Toa Payoh. 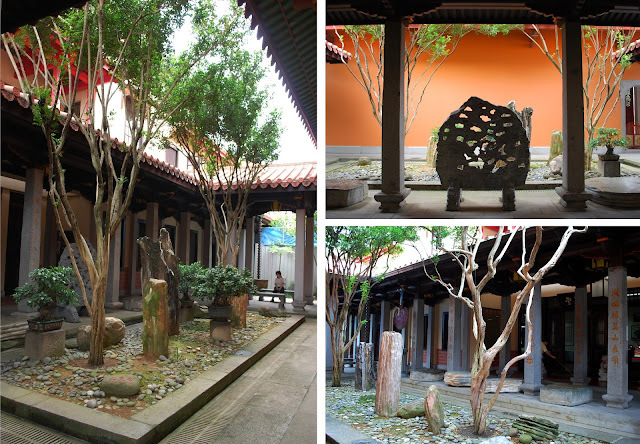 Petrified and carved stone together with expressive tree trunks form the focal points of the contemplative inner garden rooms. Both originating from the Fujian province in China, Low Kim Pong and Xian Hui called in craftsmen from their hometowns there as well from the nearby Guangdong province to construct and build the monastery. The result is a blend of architectural styles typical for these regions that reflects the Chinese immigrant society of Singapore at that time. In the late 1900s, it fell into severe disrepair and was even partially closed from time to time. It was only in 1991 that an extensive restoration project (sometimes a bit too enthusiastic - I would have loved to see more patina left in place...) was started, and it is still continuing on many areas of the grounds. More stone - a symbol of stability and endurance and a integral element of Chinese gardens. On the left, two petrified tree trunks, on the lower right, stone with surface that water has carved into a distinct pattern reminding of waves. A passageway with several penjing shaped as Chinese characters - if I only would be able to read them! Wandering through the gates, walkways and temples of the monastery easily transfers one from the daily bustle of Singapore into another, more spiritual world. I especially loved seeing how people and monks were sitting in the inner gardens, meditating and contemplating in silence (of course, no photographing was allowed inside the temples). I definitely need to know more of the Buddhist religion as now I felt (and of course, am) just like a tourist who appreciates the temples and their beauty solely on their aesthetic and visual values. But even if so much of their deeper meanings were lost on me, just sitting there enjoying the quiet peace of the monastery with a scent of incense wafting around, I know I still gained a lot.